At The Dream Hotel on Wednesday afternoon, the boxing world saw a preview of what will prove to be a fully stacked Jan. 18 Matchroom USA fight night at the Hulu Theatre at Madison Square Garden with three title fights on the main card, headlined by undefeated champion Demetrius Andrade defending his WBO World Middleweight Title against dangerous challenger Artur Akavov. The stacked card will also feature Amanda Serrano fighting for the vacant WBO World Female Super Flyweight Title, Chris Algieri making his return to the ring, TJ Doheny making his first defense of the IBF World Super Bantamweight Title, and Jorge Linares looking to retain the WBC International Silver Super Lightweight Title. In a press conference, Friday night’s fighters gathered to discuss their preparations ahead of the big night, which will be broadcasted live on DAZN. 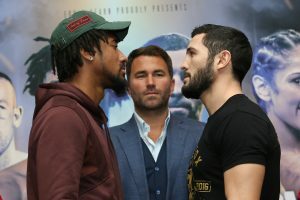 The post Press Conf Quotes: Demetrius Andrade, Artur Akavov, Jorge Linares, Pablo Cesar Cano appeared first on BoxingInsider.com.